Instructions: Click here to see a larger photo of this project. Tag is 6 x 5". Using the largest tag die from the Album Tags and Accent Die, cut through two pieces of white cardstock so you have two tags. Adhere these together using dries clear glue to form a strong base for the tag. Using the same die, cut two pieces of the Patchwork Daisy paper collection. Adhere one piece to the front of the white tag, ink the edges of the second piece and adhere to the back of the tag. Using the two largest dies, cut a border from white cardstock, sponge with dries clear adhesive and sprinkle with Crystal Ultrafine Transparent Glitter. Set aside to dry. Diecut vellum from the same die, stamp the border from the Patchwork Daisy Border Cling Stamp Set using VersaMark, sprinkle with WOW Sparkling Snow Embossing Glitter and heat set using the Heat It tool. Color the flowers and leaves using Magenta Hue, Majestic Violet, Forget-Me-Not and Vivid Chartreuse Archival inks and Stack and Store Daubers. Diecut using the coordinating die, shape lightly using the Deluxe Flower Shaping kit. Stamp, color, diecut and shape the two flourishes from the same stamp set in the same manor and add a Swarovski crystal to each of the little flower centers on one of the flourishes. Apply dries clear adhesive to the edges of the vellum border diecut and adhere to the tag. 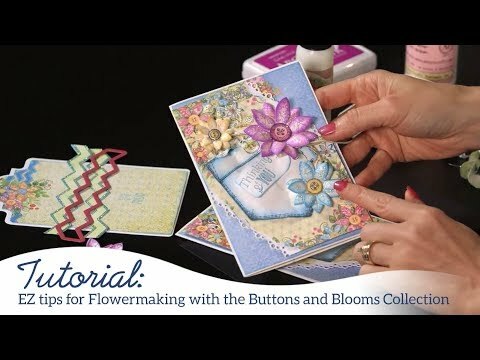 Using the Buttons and Blooms Cling Stamp set, stamp the flowers and the buttons on vellum using VersaMark, sprinkle with WOW Sparkling Snow Embossing Glitter and heat set using the Heat It tool. Color the flowers and buttons using Magenta Hue, Majestic Violet, Forget-Me-Not and Vivid Chartreuse Archival inks and Stack and Store Daubers. Diecut using the coordinating die and shape using the groove golf tool set. 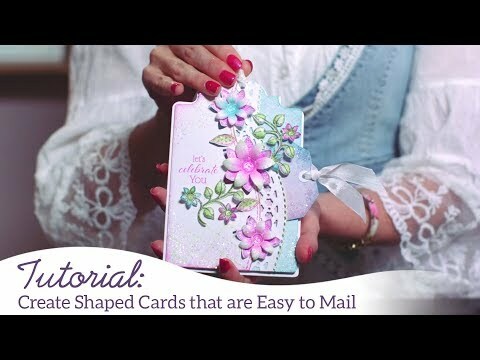 See Emma Lou's video here to learn how to shape them. Adhere two petals together, making sure to offset, to create the flowers. Using a dimensional dot, add buttons to the flower centers. Adhere the flowers to the border as shown. Adhere the floral flourish with the crystals to the tag as shown. Cut apart the second floral flourish and a small flower to the border and some leaves at the top. Stamp the arrow from the Hand-stitched Accents Cling Stamp Set on vellum using VersaMark, sprinkle with WOW Royal Crush Embossing Glitter and heat set using the Heat It tool. Stamp the sentiment in the same manner, heat set and diecut the arrow using the coordinating die. Shape slightly with your fingers and adhere to the tag as shown. Using a Crop-A-Dile make a hole in the tag, add an eyelet and a ribbon. Die cut a pocket from white cardstock using the Ornate Borders and Pockets Die, sponge with dries clear adhesive and completely cover with Crystal Ultrafine Transparent Glitter and when dry, adhere to the back of the tag at the bottom. Adhere a section of the floral flourish to the top of the tag as shown. 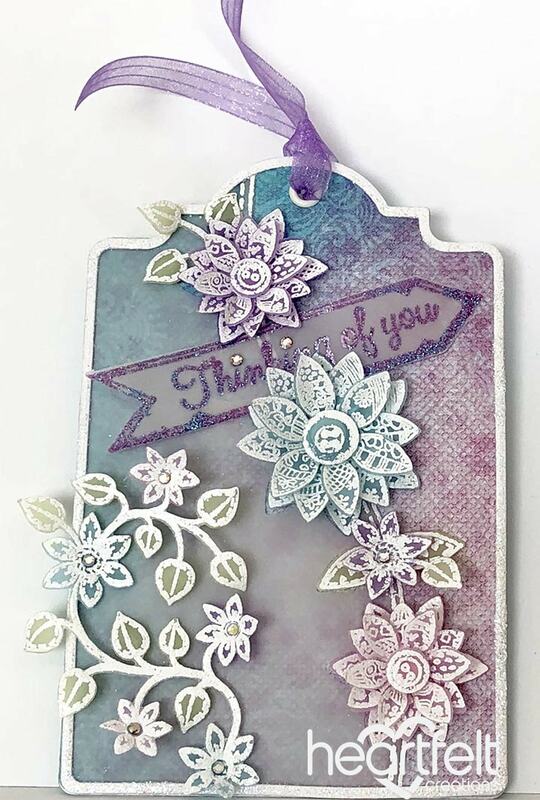 Diecut a tag from the paper collection using the Tickets and Tags Die, sponge the edges, Stamp the sentiment using Majestic Violet ink and add glitter to the design. Diecut a mat from white cardstock using the same die set and adhere the tag to the mat. Punch a hole in the top and add ribbon. Hand write a message on the back of the small tag and place it in the pocket.